Saint Patrick's African Singers is more than a choir to its members, who are mainly asylum seekers and refugees living in Oldham. 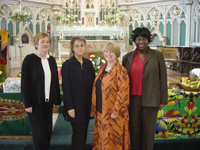 The group was formed to take part in the 2001 Christmas Liturgy at St Patricks, but its members stayed together and it has become a support system and source of enjoyment and worship. 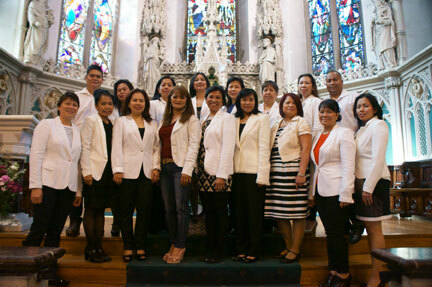 They sing once a month during mass, perform at other churches , and took part in last year's Festival of Light. Originally formed as "a one off' to celebrate the Bishop's visitation in 1998 and then later being invited to sing at the Mayor's Mass, St. Patrick's Folk Group continues to go from strength to strength. The three vocalists, vocal/guitarist all share a musical background, either being classically trained, semi-pro or ex professional. An uplifting and unique combined sound of Caribbean, Eastern European and rich English tones capture the cultural background of the members... with a bit of Oldhamer and Mancunian thrown in for good measure! We also have an Indian Choir and Parish Choir. If you would like to join any of the choirs just ask. Everyone is welcome.